Failure is an inevitable, unavoidable and integral aspect of evolving into a successful leader. Leadership requires the ability to manage setbacks and overcome obstacles, typically with finite resources, support and time. You may recall the old adage, “When life gives you lemons; make lemonade.” Now it’s time to take the adage one step further, “When life gives you lemons, make grape juice, then sit back and let the world wonder how you did it.” The question is how do we put this philosophy into action. Before going any deeper we must first address one absolute in business and in life: you will at some point fail at something and if you are at all like the vast majority of people, you will do so repeatedly. The exciting news is that although negative events affect us they do not affect us as much or for as long as we expect them to. Researchers have consistently demonstrated that individuals overestimate how devastated they will feel and how long they will feel it. If you have never failed at anything, then we invite you to consider an alternative and more relevant article. If, on reflection, you have then stay tuned for what may prove valuable information. Over the past century, notable leaders who have achieved great success in their respected fields have come forth with documented accounts of their respective failures. At first, it would seem this voluntary and public display of failure and vulnerability sits oddly against the backdrop of American corporate norms. Brave leaders such as Edison, Disney, and Ford, and more recently, Winfrey, Jobs, and Jordan have come forth and openly discussed their failures. Thomas Edison failed thousands of times at creating a light bulb. Walt Disney was repeatedly told that he should consider a new career other than a cartoonist. Steve Jobs grew Apple from his garage into a $2billion dollar company with 4,000 employees and was then publicly fired. He viewed his firing as an opportunity to start over and described it as one of the most creative periods in his life. Over his career, Michael Jordan missed over 9,000 shots, lost 300 games and failed when called upon to make the game winning shot on a total of 26 separate occasions. Yet Jordan is remembered as the greatest basketball player of all time. Henry Ford was broke at age 40 but faced failure head on and the rest is history. The moral of this message is that if you truly want something, it’s not as Churchill recommended, never giving up, but rather, never stop failing. And herein lies the logic as to why you cannot stop failing: if you stop failing you “are done,” or more accurately “done for,” because you have stopped participating in the pursuit of whatever it is that you want. The real challenge is how to keep going and continue to face failure. The answer to the challenge is in how you interpret your failures. How you interpret your failure will determine your ultimate success. 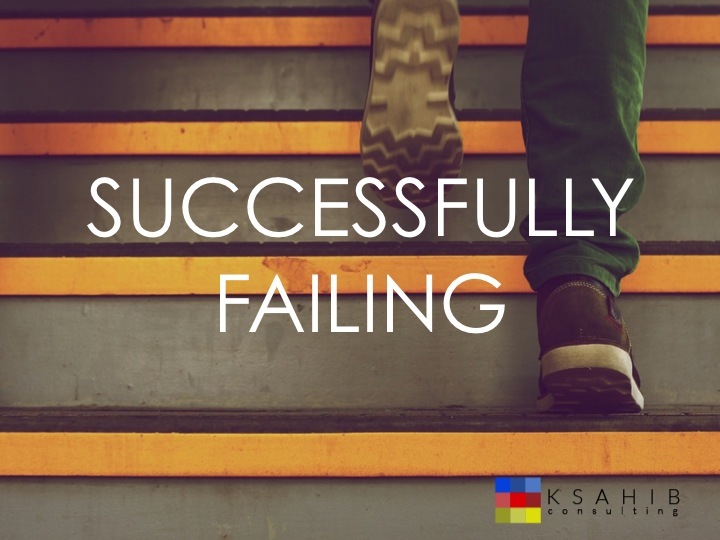 In fact, the father of positive psychology, Martin Seligman, found that the number one predictor of success after encountering failure is one’s interpretation of failure. Successfully failing can be as simple as, “making lemonade from lemons,” by modifying your goals and seeing what you can create from your fruits of failure. It could be making a challenge to yourself to find as many things that you could have learned from your failure as possible and cataloging them, or finding the one truly salient thing that you should take away as a revolutionary learning experience. Maybe it could be just looking at each attempt as one step on the journey to getting there and learning how to approach it differently each time. The point is, failure can give you a different perspective, a launch pad to begin anew, and should not be viewed as something awful, but rather as an opportunity. It is the most important part of the journey to success and the first and most important step to your subsequent victories.